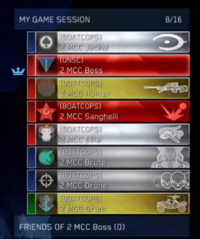 Nameplates are small icons (seen in pre-game/post-game lobbies showing player's Gamertags) that can be customized depending on certain requirements. Although nameplate emblems have existed since Halo 2 & Halo 3 in the form of small Seventh Column symbols or the Bungie logo, they have not been customizable until Halo: Reach. Nameplates were first mentioned early 2010, when Halo 2 was being shutdown and again when Halo PC users were told to keep their CD codes. 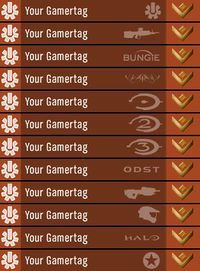 Players could customize their nameplates by signing up as Bungie.net users until March 31, 2012 when Bungie.net transferred all record-keeping responsibilities to Halo Waypoint and this capability was lost. Halo Waypoint has not yet incorporated nameplates; players are effectively stuck with whichever nameplate they currently have. Bungie.net emblem - Unlocked once gamertag is linked to Bungie.net account, and then turned on. No longer available due to shutdown of Halo 2 Xbox Live. Bungie emblem - Bungie Employees only. Default/Blank emblem - Unlocked by default. Seventh Column emblem - Unlocked once gamertag is linked to Bungie.net account, and then turned on. Pro Emblem - Given exclusively to Louis Wu. Blank emblem - Unlocked by default. The Septagon emblem – Unlocked once gamertag is linked to Bungie.net account. The DMR emblem – Unlocked by being a Bungie Pro subscriber. Bungie emblem - Bungie Employees Only until June 13, 2011, limited time for people who downloaded the Bungie Mobile app. Marathon Durandal emblem – Unlocked by playing the full version of Marathon: Durandal on Xbox LIVE Arcade to enable the Jjaro Terminal emblem. Halo PC emblem – Unlocked by entering your Halo PC (Mac version also compatible) product key to enable this emblem. Each key can only be used once. There is no way to validate those who have played the Xbox version. Halo 2 emblem – Unlocked if you played Halo 2 for Xbox on your LIVE account before April 14, 2010. Halo 3 emblem – Unlocked if you played Halo 3 on your LIVE account. ODST emblem – Unlocked if you played Halo 3: ODST on your LIVE account. Assault Rifle emblem – Unlocked if you participated in the Halo: Reach public beta, from May 3, 2010 to May 20, 2010. Spartan Helmet emblem – Unlocked by unlocking four of the following five nameplates: Halo: CE, Halo 2, Halo 3, ODST or Assault Rifle. HALO emblem – Unlocked once the emblems for Halo: CE, Halo 2, and Halo 3 are unlocked. The Star emblem - Unlocked by winning the Bungie All-Stars contest, downloading the Bungie Mobile app released June 13, 2011, or by receiving the nameplate from an individual with the app. Various nameplates in Halo: The Master Chief Collection. Unlike in Halo: Reach players can switch nameplates in-game in Halo: The Master Chief Collection. The dozens of nameplates in the collection must be unlocked before they can be used. Most are unlocked along with accompanying achievements; the Spartan Strike nameplate is unlocked for playing Halo: Spartan Strike. Like player's emblem, the nameplate is used for all games in the collection. ↑ Bungie.net: Come on Baby Light my Fire!